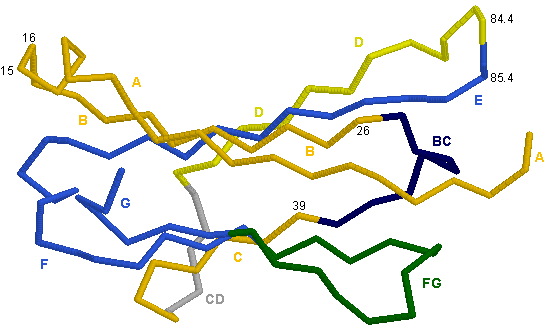 C-DOMAIN strands are colored according to the IMGT color menu for strand representation : A, B and C strands (orange), D strand (yellow), E, F and G strands (blue). This image has been generated with the program RASMOL version 2.6  from the PDB file 1dee , containing the atomic coordinates of the crystal structure of a Fab fragment of a human IgM antibody. Sayle, R. and Milner-White, E.J. Trends Biochem. Sci., 20, 374 (1995).